We hope you find many of the answers you are searching for through these FAQ's. For any further questions or inquires of any type, please reach out to Harbor Soccer Club General Manager Jason Jarrett via email or phone. Contact info: click here. Thanks for your support of Harbor Soccer! The goal of Harbor Soccer Club is to provide the best possible, all-round soccer experience for ALL of our players. We have developed a program titled The Harbor Soccer Way which closely follows the ideals described in the US Soccer Federation and US Youth Soccer curriculum and the Best Practice guidelines for youth soccer player development provided by both organizations. We endeavor to place an emphasis on skill level advancement, learning to play an attractive brand of soccer, good sportsmanship and teamwork. We will base our successes on how well our players develop – not just on the pitch, but as young people, all while remembering that this is a competitive sport. If Harbor Soccer Club players are enjoying their soccer, advancing their skill level, being taught the beautiful game by enthusiastic, energetic coaches, then we know we will achieve great things. This is the Harbor Soccer Way! Want to play for Harbor Soccer? When will I be notified of when practices begin? Typically, coaches will notify their players when practices begin in early to mid-August. How long is the soccer season? The fall Recreation Soccer season starts in August. Games begin the first weekend after Labor Day, and generally run through the middle of November with some older teams playing into the first week of December. Can I choose what day/time my child plays? No. Harbor Soccer Club relies on volunteers to coach and they are able to choose the practice schedule that works best for them. Can a child play in an older age group ("play up")? While this generally is not advised, a player who is at the oldest age for their classification may be allowed to play in the next oldest age group. A parent or guardian will have to make a special request at registration. The Harbor Soccer Club Program Director will need to discuss this with the parent or guardian and possibly evaluate the player before granting permission. Can a child play in a younger age group ("play down")? My child has little soccer experience. Will they get much playing time? Coaches are directed to divide playing time as equally as possible for all players, regardless of ability. Shin guards and cleats are required for practice and games for players playing recreation soccer (ages 4 and up). A water bottle should be brought to every game and practice. Soccer balls are provided by the club. Full Uniforms are provided to all recreational players, which includes a numbered jersey, soccer shorts and socks. Can my child be placed on a team with their friends or a particular coach? While there is a place in our registration system to enter a Friend Request, such requests should not be looked at as guarantees. Please review our Registration Policy for further information on team placement. What about "rain-outs" or cancellations? Rain does not mean a game or practice is cancelled. For games, coaches and referees must meet at the field to determine playing conditions before canceling. Players should report to the field by game time. Soccer can be safely played in a light to moderate rain. We will not play or practice while lightning is visible from the field location. Will soccer conflict with other sports? Harbor Soccer encourages all kids to play multiple sports. Since the fall soccer season runs from August through November, there may be times when there is a conflict. Please inform your coach as early as possible of any/all conflicts. They will need to plan their practice/games accordingly. What is the Harbor Premier’s philosophy on player development? What are the qualifications of the Harbor Premier coaching staff? We have assembled some of the finest coaches in the Puget Sound area. Our Technical Director and General Manager is Jason Jarrett. Our Girls Director of Coaching is Shawn Alire and our Boys Director of Coaching is Darren Brookman. Mitch James is our Youth Director of Coaching and oversees all teams U12 and younger. He brings loads of energy and enthusiasm to our youngest ages. We employ many staff coaches with exceptional abilities and credentials. Credentials of these coaches include pro, semi-pro players, national team players, college players, and numerous player and coaching awards and honors. Individual coach qualifications are available on line. What additional training is available? In addition to our regular team training, players will be able to take part in a 3rd session each week that will be done in a group format with teams similar in age. Trainers of these group sessions will focus on the technical side of the game, incorporating as many touches as possible into the extra session. Harbor Premier is a year-round program. Tryouts will immediately follow the conclusion of the previous year Washington State Cup finals for the age group. Training will begin immediately and games will begin with tournament play in the summer. The season can really be broken down into 4 phases: summer tournaments, fall RCL league play, spring RCL league play, & State Cup. Harbor Soccer Club does not own or operate a set of fields. Most practices are held at Peninsula School District fields. We use grass fields when conditions cooperate (weather & daylight primarily) during the summer and late spring. When conditions do not allow use of grass, we move to turf at Gig Harbor High School or Peninsula High School. How often are practices and games? Teams will practice at least twice a week. Following tryouts a coach may elect to have three team practices per week before the 1st tournament to get the team together. The 3rd session option already discussed above is available to all Harbor Premier players. Our league, the Regional Club League, is comprised of clubs throughout the Puget Sound area as well as from Spokane, Yakima, Tri-Cities and Vancouver. Travel will be dependent on which teams from these clubs are in your division. In some cases, travel will be minimal. In others, you may have 1 or more travel games involving extensive travel. Tournament travel varies by team. In most cases, teams in the U10 and below ages typically attend tournaments within 50 miles with the possibility of 1 tournament at greater distance. Older teams may choose to travel more extensively determined by competitive goals. Our top teams within the older age groups will travel as necessary to find the level of desired competition and showcase opportunities for next level play. What if my child plays multiple sports? How do the coaches view this? We believe in allowing our players, especially at the younger ages, to play multiple sports. Overall motor skills development, coordination and agility can be greatly affected by playing sports of differing demands. Coaches will have an understanding of these opportunities to build a more rounded athlete that ultimately benefit the player in the long run. Older teams will expect a higher level of commitment and it may become more difficult to participate in multiple sports. What is the expected attire for team practice? If you want to be a player then you must look like a player. As such, Harbor Premier will provide training shirts with your initial uniform. These shirts are used for practice shirts along with black shorts. Some of the teams may even elect to use them as alternate uniforms. Your coach or manager will communicate which color to wear on which day – please do your best to follow this schedule as we want our teams to look the part on the field. What equipment does a player bring to practice? All players are required to wear cleats and shin guards. Players will also need to bring the team soccer ball and water. Please remember that only water is allowed when training or games are taking place on a turf field. Do the Goal Keepers receive individual training? 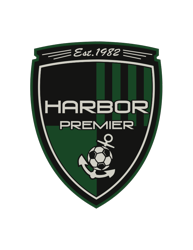 Yes, the Harbor Premier keepers have their own trainer and Harbor Premier offers keeper training all year. Our keepers are clearly a cut above the rest, and this specialized training is the key to our future success. What is the Harbor Soccer Club refund policy? What is the Harbor Premier guidelines for playing up in age? Please feel free to copy all three on the initial contact as well. We are all here to help and to make the Harbor Soccer experience the best possible. ©2019 Harbor Soccer Club / SportsEngine. All Rights Reserved.